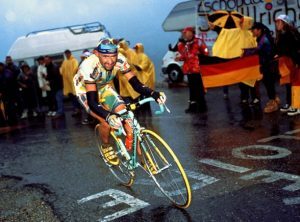 Marco Pantani (13 January 1970 – 14 February 2004) widely considered as one of the best climbers of his era in professional road bicycle racing. He won both the Giro d’Italia and the Tour de France and in 1998, is the last cyclist, and one of only seven, to win the Giro and the Tour in the same year. Pantani’s attacking style and aggressive riding turned him into a fan favorite in the late 1990s. He was known as “Il Pirata” (“The pirate”) because of his shaved head and the bandana and earrings he always wore. At 1.72 m and 57 kg, he had the classic build for a mountain climber. 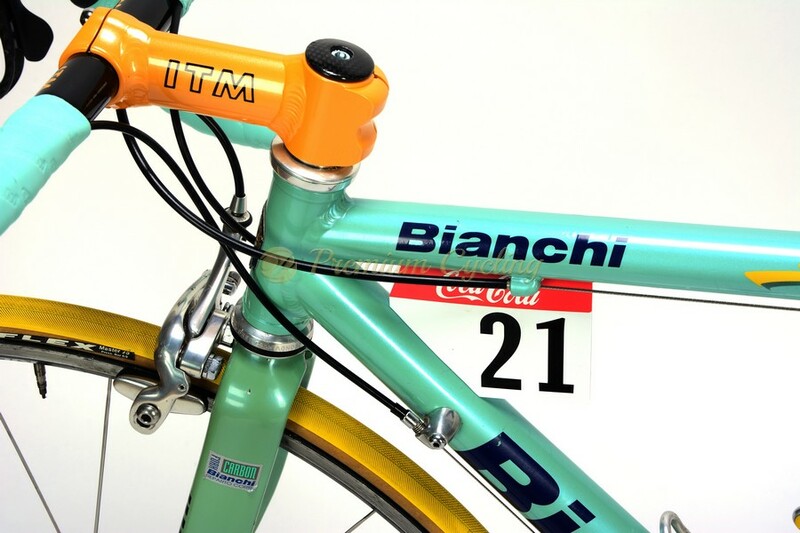 Bianchi’s Reparto Corse (Bianchi’s Race Department) facility hand built frames for their top riders and of course Marco Pantani was one of them riding for Mercatone Uno sponsored by Bianchi. 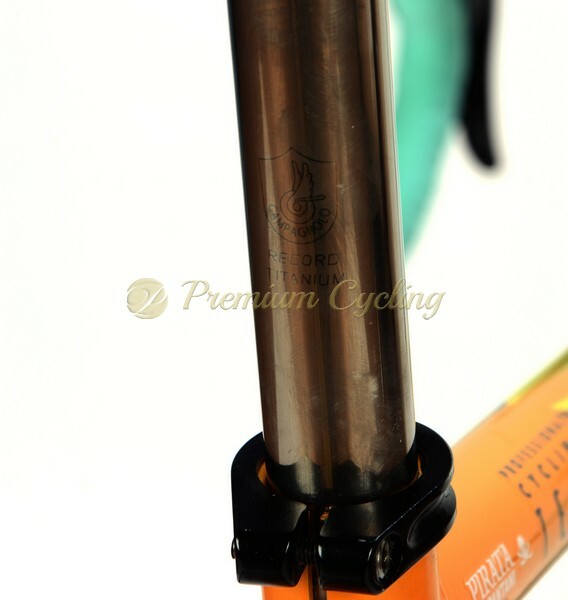 Their top model Mega Pro was made of exclusive set of Plain Gauge Aluminium 7005 heat treated shaped tubes. 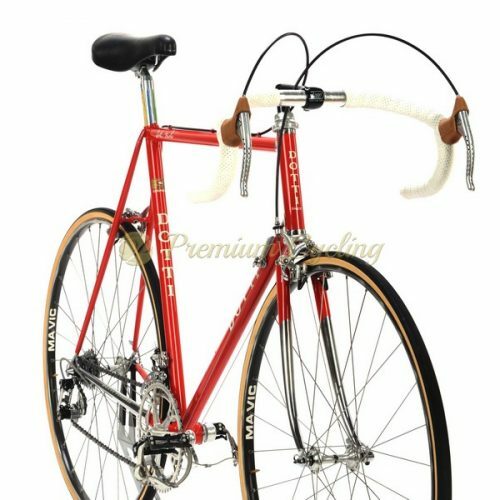 Aluminum was the material of choice back then, even some of his biggets rivals rode full carbon bikes. 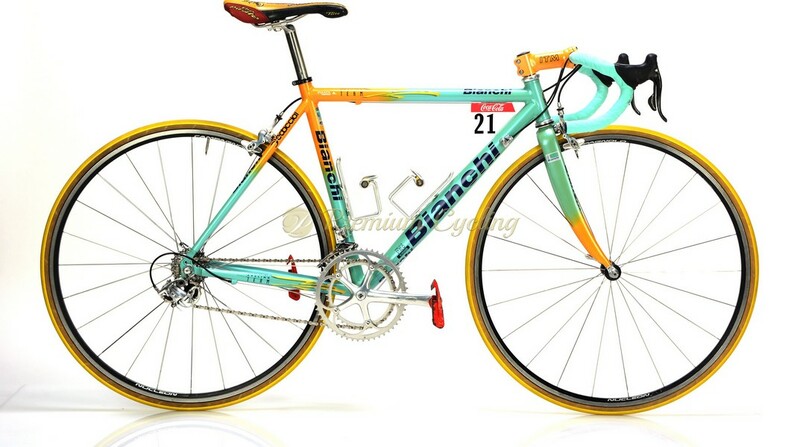 Proudly presenting one of the most iconic bikes in cycling history, the Bianchi Mega Pro Mercatone Uno, very very similar to Marco Pantani’s bike on his way to winning Giro d’Italia and Tour de France back in 1998. The frame is shinning in beautiful mix of Bianchi and Mercatone Uno paintjob, build with Campagnolo Record 9s Titanium groupset, Campagnolo Nucleon wheels, Record Titanium seatpost, Pantani’s personalized Selle Italia Flite titanium saddle, Time Equipe Mag pedals, so all exact components as used by Pantani back in 1998. The cherries on the top of the cake is exact Pantani’s frame size & bike fitting and number plate 21, ( same number was used by Pantani at the Tour de France 1998). 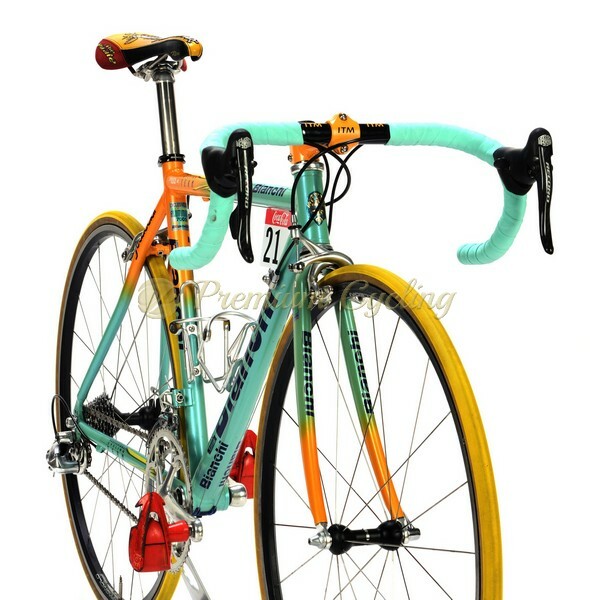 Unique chance for all Pantani fans to get this amazing replica. Fair price! Condition: Used, but good condition. Some touch-ups signs of normal use. All parts are working fine.